The pain is going to last longer for residents and businesses on Indian Creek Drive between 25th and 41st Streets. The construction project there, already in month 29, has hit another snag. 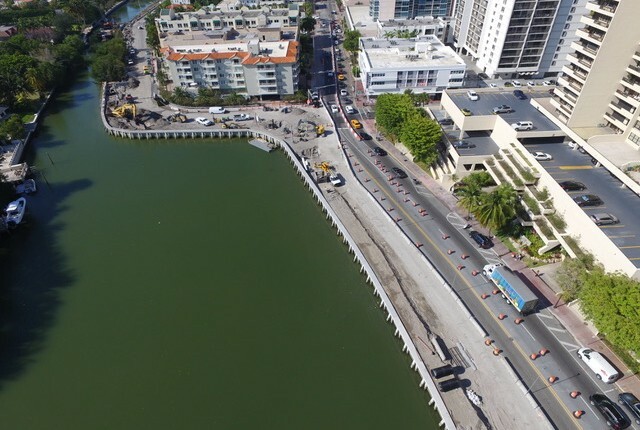 Bids for Phase III were rejected this week after they came in more than double what the City of Miami Beach and Florida Department of Transportation (FDOT) had budgeted. A brief history: The project is one of the City’s early efforts to address flooding. It involves three phases and another to rebuild the public seawall in the area. Phase I which included installing storm water drainage improvements on Collins Avenue between 25th and 26th Streets has been completed. Phase II, installing storm water drainage improvements on Indian Creek Drive between 26th and 32nd Streets including underground work for a pump station at 32nd was supposed to be completed this past summer. When projected costs ran over the original $25.5 million budget for the road work, the City had to go back to FDOT which owns the road to ask for more money. FDOT agreed, kicking in another $6 million with the City contributing another $1.5 million. In November, Assistant City Manager Eric Carpenter told City Commissioners the additional funding would allow the city to begin final construction on the roadway. Fast forward to this week when Miami Beach City Manager Jimmy Morales told Commissioners there was an issue first with the low bidder, LEAD Engineering Contractors, not submitting a fully complete Bidder Certification Form but then later withdrawing for what the company called “honest mistakes it made in the preparation of the bid.” LEAD’s bid was a little over $14 million which Morales said LEAD determined they couldn’t honor. The other two contractors, David Mancini and Sons, Inc. (DMSI) and Ric-Man International, Inc. were well above the $10,950,000 budget. Mancini, which was the contractor for Phase I and II of the roadwork, bid a little over $22 million while Ric-Man came in just shy of $24.5 million. “FDOT has agreed to convene a workshop in the coming couple of weeks to try to come up with a Plan B or Plan C to try to get this project moving,” David Martinez, Director of Capital Improvement Projects, told Commissioners. In an email follow up with RE:MiamiBeach, Martinez said that workshop has tentatively been scheduled for January 23. The road project was originally projected to cost $25.5 million – $20 million from FDOT and $5.5 million from the City. The cost in November was estimated to be $33 million – $26 million from FDOT and $7 million from the City. Meanwhile, the seawall portion of the project has been stopped for a year after it was discovered segments of it were noncompliant with environmental regulations and not properly permitted. The City fired its engineer and has been negotiating a resolution ever since. That resolution appears to be at hand with the City agreeing to remove and relocate three sections of the wall, splitting the approximately $1 million cost with the contractor.